Love cereal but want to stay away processed food? Meet your new match. 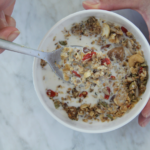 We made this raw granola couple of days ago and it was AMAZINGLY delicious! This recipe will certainly make a regular appearance in our kitchen. This is a raw, vegan version of granola. It's very simple to make and doesn't require a dehydrator. It is full of super foods such as chia, flax and goji. An excellent protein packed way to fuel your body. Soak sunflower seeds, pumpkin seeds and cashews in a jar filled with room temp water for 4-8 hours (overnight). 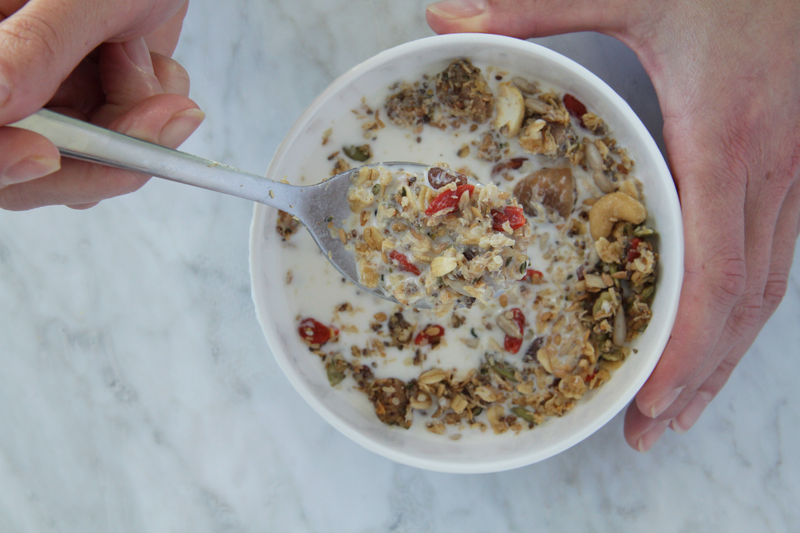 Place raisins and goji berries in a separate bowl, cover with (½ to 1 cup) water and soak for 15min. In a fine mesh metal strainer, drain and rinse the seeds and cashews and discard the soaking water. 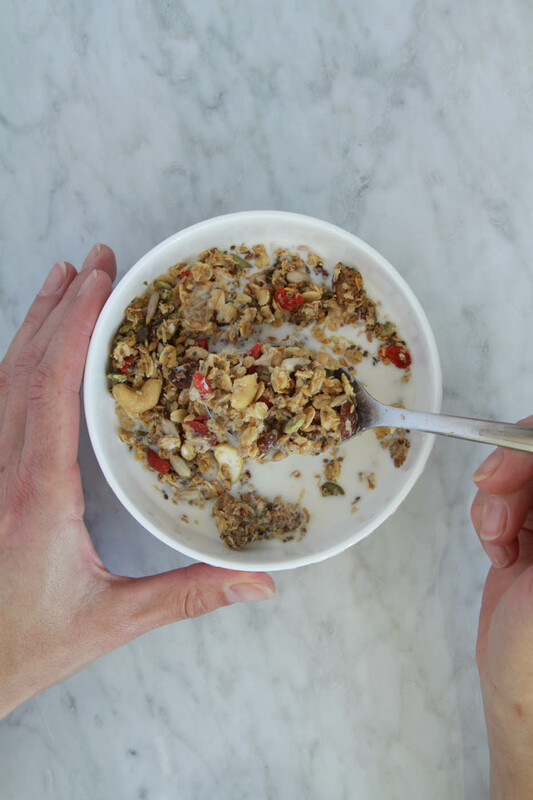 Repeat the same with raisins and goji berries. Combine all dry ingredients (coconut,flax seeds, chia seeds, sunflower seeds, pumpkin seeds, cashews, raisins, goji berries, chopped figs, cinnamon, salt + any optional ingredients) in a large bowl. Now it's time to make the "sauce". Cacao butter is too hard to use in its solid state, and must be melted before being added to a recipe. No worries, this is an easy process! Simply use a chef's knife to finely chop the cacao butter, and gently melt in a small sauce pan over the lowest heat. The cacao butter will fully melt within just a couple minutes, and you should remove it as soon as the last bits of white disappear. Allow it to cool for 3-5 min before adding the agave syrup. Pour the sauce over the dry ingredients and mix well with spatula to incorporate all the ingredients. Cover the bowl with a lit or plate and place it in the fridge for 1-2 hours to solidify. 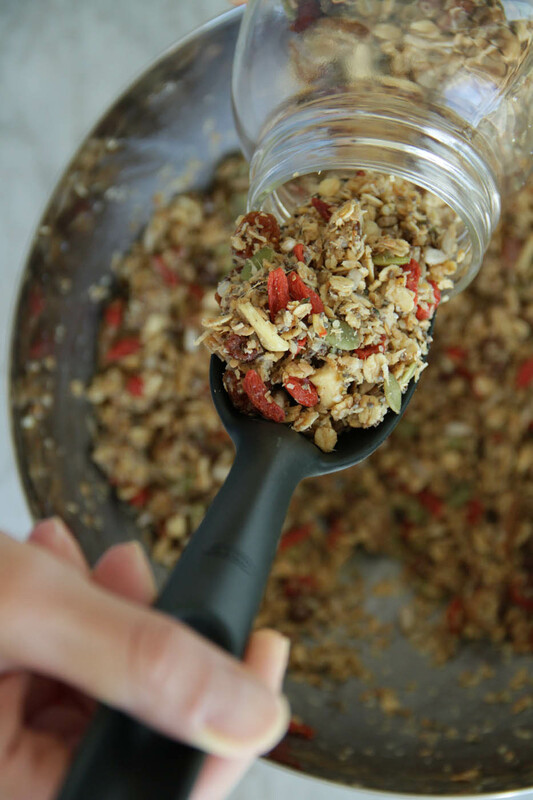 Transfer granola into a glass jar and store in the fridge for unto 2 weeks. Happy granola making and enjoy.